As well as plum is the prettiest tree from rose family so that’s JELICKI DUKAT is rose with the best flavour among OLD SERBIAN brandies. JELICKI DUKAT is an old Serbian plum’s brandy with 45% v/v which stayed in oak barrels for 12 years. It came from the best quality kinds of plums from orchard family Prodanovic from village Pridvorica, on the east slopes of mountain Jelica near Cacak. JELICKI DUKAT is being preserved in basements of family Prodanovic where optimal temperature and moist give best conditions for ripening brandy. 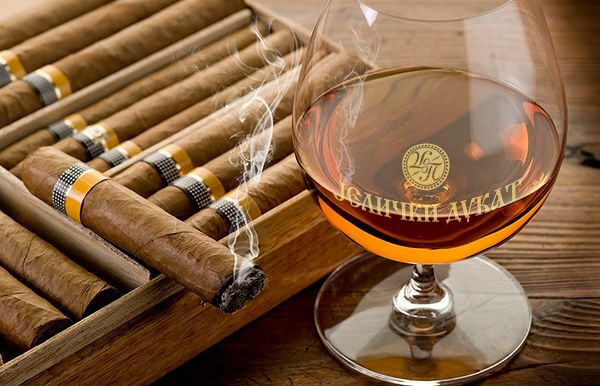 Oak barrels, usually 500 liters volume, in which brandy stays for years, are creditable for forming specific flavor and tasty performance of this drink. Normal control of old and new distillates of JELICKI DUKAT gives all time quality and the top position on our and foreign market. The production of plum brandy is tradition in The Prodanovic family, as old as family themselves whose roots date from 18th century Cacak .The winds that whip our country,our people, and so do The Prodanovic family made this old brandy as valuable as ducat. Brandy represented pawn for safer but always unlikely future. It educated children, married sons , married daughters, payed taxes and enabled that in happiness and with optimism wait for tomorrow. 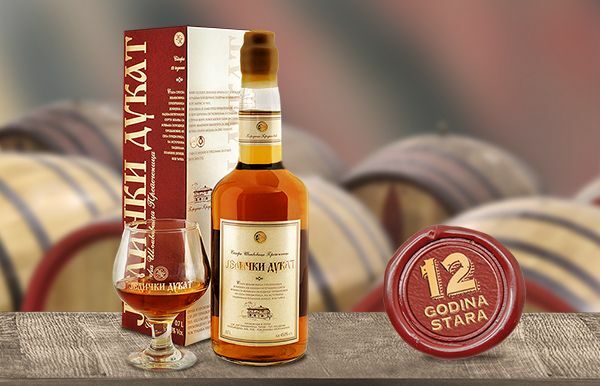 12 years of aging in oak barrels gave JELICKI DUKAT golden yellow, amber color refined taste. Cheers! JELICKI DUKAT caries the spirit of past and forgotten traditional values and new age yet to come . It merges traditional recipe and high technology, elegant and modern package but directness and warmness of Serbian village. JELICKI DUKAT is drink of unique taste which contains tradition, too. It’s drinkable and it has the color of amber(golden yellow). It unites the taste dominated by oak flavour,with velvet presence of plum. Meadows and forests which surround the orchard bring the taste of flowers. Old oak barrels in which DUKAT ripens for 12 years makes it closer to cognac than to brandy. CONSUMING OF JELICKI DUKAT JELICKI DUKAT is a product that can be consumed a whole day.We suggest serving it in wide ‘’cognac’’ glasses on 17 to 20 degrees. Then it will have most of it’s flavour and taste. Challenge is serving cold DUKAT on 5 degrees and then follow the release of flavour wile warming up glass with warmness of a palm. The unique flavour allows JELICKI DUKAT to be drunk both as a digestive and an aperitif. JELICKI DUKAT is drink which perfectly gets along with dishes from venison or red meat. For a dessert with DUKAT we recommend chocolate cakes,as well as pies and prunes. The smell and taste of quality cigarette with JELICKI DUKAT will surprise the greatest hedonists. At the end maybe it’s best to follow your instinct and personal affinity. But drink RESPONSIBLY! JELICKI DUKAT with pride carries epithet THE CHAMPION OF QUALITY AT NOVI SAD FAIR 2002. This award JELICKI DUKAT makes unique on market and distinguish it from other similar products. 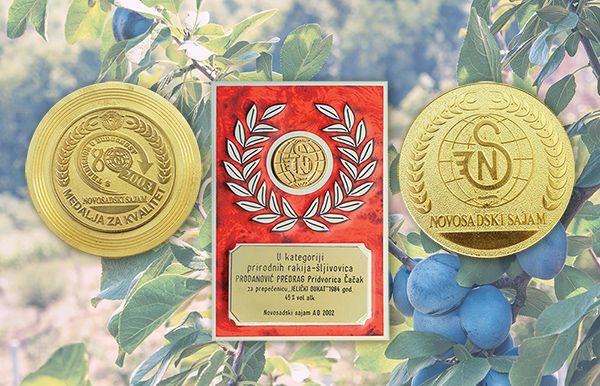 Quality verification is continued by participating in Fairs and winning following awards: GREAT GOLD MEDAL AT NOVI SAD FAIR 2003. GREAT GOLD MEDAL AT NOVI SAD FAIR 2013. CHEERS! JELICKI DUKAT brand is protected by intellectual property office of Serbia, brandy is produced and filed by ‘’PP’’ Pridvorica, Cacak.